Excellent for freezing meats and fish! Make custom-size bags so you can always have just the right size bag on hand. Weston Brand Commercial Grade Vacuum Rolls are reusable and dishwasher safe! Works with Most Vacuum Sealers. 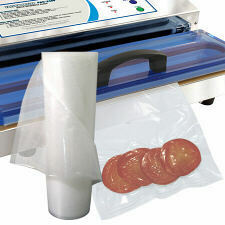 For use with the Weston Pro 2100 & Pro 2300 Vacuum Sealers. May also fit other brands of vacuum sealers.